Nominee Ellen Page opted for "simple and elegant black" in simple long necklace. Rebecca Miller In black dress with vintage looking earring and a big brooch. Diablo cody in lots of yellow gold jewellery, big earring witha danger sign lol, and look at her ring, its HUGE. I like her braclet and bangles. krisitn chenoweth in white gold and diamond braclet. Marion Cotillard,wore Chopard’s champagne diamond briolette necklace (64 cts.) with light and dark brown diamond bead necklaces (106 cts. ), and a square cut brilliant cut yellow diamond ring (15 cts.). 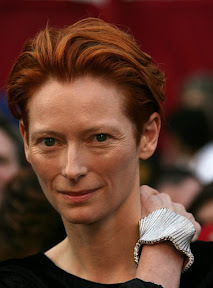 Tilda Swinton, i suppose she is without make-up, her braclet is all white diamond. Nicole Kidman's necklace is reportedly set with 7600+ diamonds of different types, including rough, faceted, and polished stones. 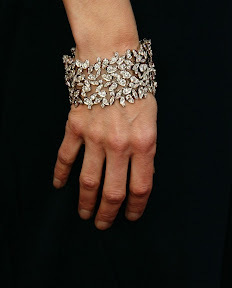 The piece was designed by L'Wren Scott and overall it contains about 1400 carats of diamonds. Penelope Cruz, wore Chopard’s ruby and diamond drop earrings a fancy shaped diamond bracelet. Renée Zellweger on the red carpet in Cartier jewels. Kathryn Heigl in Ryan Ryan jewellery. 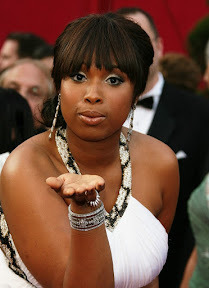 Jennifer Hudson wore platinum bangles, earrings, rings, and a hair pin. Hilary Swank glistened as a presenter in Chopard’s flower diamond hairclips, round cut diamond earrings on a French wire (9 cts. ), and snowflake diamond bracelet. Jennifer Garner at Oscar in Van Cleef & Arpels vintage necklace 61 carat collar necklace, earrings, bracelet and rings. Keri Russell in H.Stern’s floral necklace with 46 cts diamond and floral earrings. Anne Hathaway on the red carpet, Diamonds from Harry Winston. Heidi Klum jewellery by Mouawad. Amy Ryan, sparkles in H.Stern’s earrings with more than 32 cts. of diamonds set in 18k white gold and floral bracelet made especially for the 2008 Red Carpet in 18k white gold and diamonds. 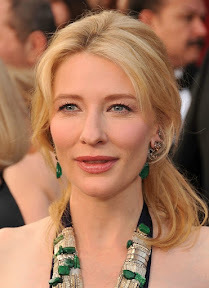 Cate Blanchett ,her jewelry is by Schwartz.You have to Zoom in the picture too look at her earring, they are a beauty. Green Emerald and diamond with vintage look.